Home New Product HugsVape Ring Lord RDA Preview – “Novel” Air Flow Design! 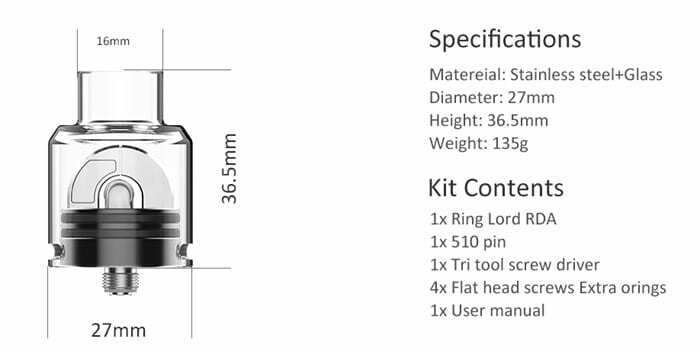 HugsVape Ring Lord RDA Preview – “Novel” Air Flow Design! The HugsVape Ring Lord RDA is a beautiful looking new RDA. I haven’t had much to do with HugsVape but they have a friendly sounding name! The company was only established in 2017 and have quite a range of mods and atomisers to their name including the HugsVape Theseus RDA which was the only one I had heard of! Despite being stunningly beautiful and having a slightly dodgy name what does the Ring Lord promise us? The first thing you spot is the crazy looking “tunnel” inside the glass cap. Now this is an “airflow tunnel” which channels the air which enters the bottom air intake slots and swooshes it around the coil. By rotating the glass top cap you can open up or restrict the incoming airflow. The tunnel part also blocks off spits coming from the coil. There is a solid 510 pin installed to use this as a dripper but the kit does include a hollow bottom feed 510 pin so you can use this on a squonk mod. The build deck is for single coils and there are 4 clamp screws so you can choose how to mount the coil. There are 2 colours to choose from – Stainless Steel and Gun Metal. This certainly looks stunning and the airflow design is something very different. Be nice to see if it does improve the performance. Is the HugsVape Ring Lord RDA “Novel” enough for you? Let me know your thoughts in the comments below!